Your identity is what you chose it to be. Everyone’s identity tends to be multiple and not singular as everyone has a race, or ethnic origin, a gender, a religion, a sexuality, an (dis)ability, an occupation, etc. We all have many affiliations that make us who we uniquely are. Identity cannot be imposed as we make choices every day about our affiliations. Only we can know how we feel about who we are – the country we resonate with and feel we belong to. You cannot tell other people what their identity is. Rather, you need to build CQ (cultural capability) to find out what other people’s identity is and not to stereotype, whether that relates to a fifth generation Indian kiwi who was born in NZ, or an Anglo-Saxon man born in Upper Hutt who has spent most of his life working throughout Asia. Diversity is about difference and accepting that we are all diverse, and accepting the different ways people choose to identify themselves will build social and financial capital in NZ and around the world. Acceptance allows people to meet their true potential and not constantly be outsiders. 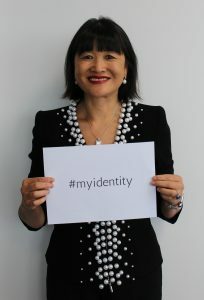 We challenge all New Zealanders to join us, and post a#Myidentity of yourself, your family and friends. The stories about our identities shows that there is no them and us. There is only us. People’s identities are becoming increasingly complicated, especially in New Zealand which is the fourth most superdiverse country in the OECD and in Auckland which is the fourth most superdiverse city in the world. “Identity” is the relevant twenty-first century issue in place of the twentieth century’s concept of “ethnic and national origins”. But the concept of plural identities has not yet made its way into our conversations about diversity and inclusion, or Laws or Policies. For instance, the New Zealand’s Bill of Rights Act 1990 and the Human Rights Act 1993 protect against discrimination on the basis of (among other things) “colour”, “race”, and “ethnic or national origins, which include nationality or citizenship”. Similarly, important international human rights conventions refer to “race”, “national or social origin”, “descent”, and “national or ethnic origin” (among other things). However, ethnic and national origins are just one element of an individual’s full identity. Intersectionality is the way forward. Everyone has a race, gender, sexuality and (dis)ability. With this challenge, we want to capture your story about your multiple identify and thus to reframe the conversation about belonging. You can upload your video www.myidentitychallenge.com which was launched on March 1, 2018. If you want to be a part of the challenge before March 1, reach out to Karinia Lee, CE, NZ Asian Leaders and Priti Garude, Marketing and Communications Manager, NZ Asian Leaders. Mai Chen, Managing Partner at Chen Palmer and founder of the Superdiversity Institute as well as MyAdvice.Legal, recognises the challenges their unique identity may bring to new migrants, when trying to understand a different legal system. “We wanted to be responsive to New Zealand’s growing number of Chinese new migrants. By providing MyAdvice.Legal in their own language, we hope that they will be able to seek legal advice to address their problems”. MyAdvice.Legal is an online marketplace that provides a platform for matching clients with legal problems with lawyers that have expertise in the relevant area of law. It is free for clients to use MyAdvice.Legal to submit a legal problem. Indeed, users of all identities are encouraged to give MyAdvice.Legal a try – register now.